Discuss, share information, ask questions, and show off your expertise on Yoder Stick Burners. Can you cook whole hog/pig on a Yoder Kingsman? You would need to decide how you wanted to place the pig, i.e., splayed, racer position, standing up, etc., decide if the head and trotters will be left on, and then make sure that the pig will fit within the cooker's cooking chamber dimensions. I prefer doing them splayed. 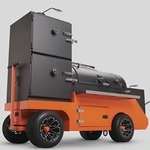 Are there any tips you or anyone can provide about doing a pig in a Kingman smoker i.e. size, position,. Or can it even be done in a Kingman? You can cook anything that fits on a smoker. This is entirely about matching what is bring cooked to the cooking chamber dimensions. I have not cooked a whole hog, but have seen it done. The firebox side is the hottest so I would put the shoulders toward the firebox, skin side down, sans head and trotters.